The simplest steps for starting a project are as follows. 3) Immediately save the file in the folder you created. Don't worry if you forget to save immediately, 3DWriter will prompt you when you attempt to make your first hyperlink. 3DWriter expects all files for a project to reside in a single folder. This is because 3DWriter is specifically designed to eliminate the a major problem people encounter with other HTML editors. Project links often function fine during project creation, but cease to function if the project is moved to another location on the computer or placed on the web. With 3DWriter, once you create a project folder, you can move it anywhere and the links will function properly. It is always good practice to use all lower case letter and not use spaces in file names. Capital letter and spaces can present problems for users and web browsers. It is also a good practice to name the first page in each project “index.htm”. If you are going to build a portfolio, a web site, or a communication center, using an index.htm page as the first page in each folder will make linking much easier. This will be covered in more detail in the tutorial Building Student Portfolios and Teacher Communication Centers. 1) Select the words you want to become a link by dragging and highlighting them with the mouse. 3) That will bring up this dialog box below. If the link is to an Internet site, type in the full URL, such as http://www.3dwriting.com/ . If the link is to another file you may type in the file name or click on the Select File icon. If you click on the Select File icon, the following dialog box will appear and display all of the files you have saved in the project folder. To test a link, simply right-click on it and select Open Link in Browser. You may also Edit the link or Remove the link by using the right-click method. Insert a picture through the Insert menu. When you choose to insert a picture, this dialog box will open. This dialog box will allow you to select the type if file you will display. While you can use many file types in a 3DWriting Project, if you plan to place the project on the it on the Internet, the file must be a .jpg or .gif. If you don't see the file you are looking for, open the Files of type: drop down menu and select the type of file you are looking for. Once you save a 3DWriter file, it becomes a web page with an .htm extension. If you double-click on it at this point, it will display in your web browser and you will be viewing it, but will not be able to edit it using your browser. 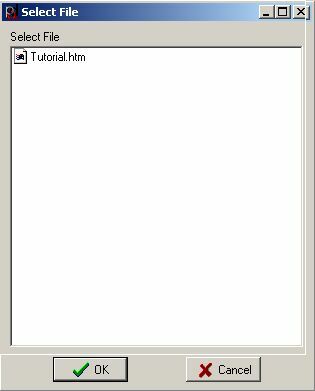 To edit any html file, even if it wasn't created by 3DWriter, just start 3DWriter, select Open from the File menu, navigate to the file you want to open, select it, and click the Open button.